A core component of any collaboration effort is an organized, helpful system for knowledge sharing across projects. One way to achieve this is through the use of a project wiki. A web page that can be edited by multiple users, wikis essentially function like a central filing document with handy resources that your team can easily access at any time. It’s a place for knowledge to be stored, shared and archived for both ongoing project execution as well as future applications. Ward Cunningham, the developer of the world’s first wiki software, borrowed the word “wiki” from the “Wiki Wiki” airport shuttle at Honolulu’s Airport. In Hawaiian, “wiki” means quick, and “wiki wiki” means very quick. Drawn to the alliteration, he named his simple online database “WikiWikiWeb” after it. A wiki in project management is an online text document that lays out important project information for the team at large to view on demand. You can pin project notes, add to-do lists, create tables, and even upload images, napkin sketches, or diagrams if you are a visual organizer. Wikis are a multi-author document which means they can be created or edited by anyone. They do not have a document owner or admin, which makes them integral for high-trust collaborative projects run by “open and flat” design teams. They are however still useful even for closed, hierarchical teams if there is a general understanding that the project manager, BIM manager, and/or similar admin user are the only ones who will create and edit them. From a simple text editor on a website to a more complex project management platform, you can abstract or reimagine a project wiki in many ways today. If you are an architect or engineer using BIM 360 Team for design collaboration, you can set up project wikis in the “Wiki pages” section of all your projects. If you’ve never set up a project wiki before, here are 3 ways to use them in your next design project. Everything that’s important to your project should be slapped onto your project’s virtual bulletin board—the project wiki. Think of it as the readme.txt file that comes with every piece of software you install. It contains important information from how to install and operate it, to troubleshooting and copyright information. Your project wiki is just the same, a cheat sheet or public bulletin board with important information visible to all. Does your project have a tentative schedule? Add it to your project wiki. Remember that email from your project admin with a staffing list and contact info? Add them to the wiki in a nifty table, especially key specialists who can resolve BIM or IT issues. As you plan and build out your vision for the project, you’ll cycle through tremendous amounts of data from source files that will inform design intent to create the final BIM model. These are all essential components of your “virtual bulletin board” or project wiki. 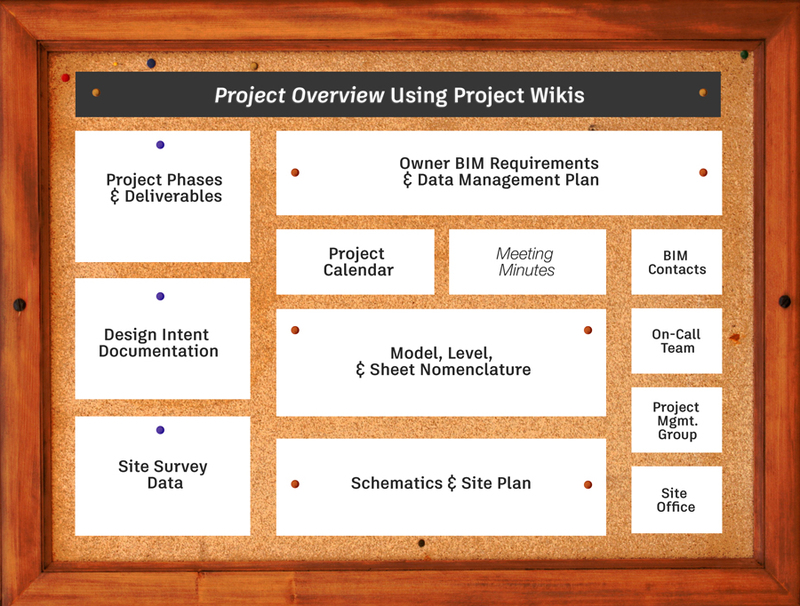 Create a roadmap or BIM Execution Plan for your design project with the help of one or more project wikis. Sharing important project tidbits to your team via email? Stop and ask yourself: Will this be best added to the wiki? Old habits are hard to break. So when you run into links or resources that the team could benefit from, update your project wiki instead. Announce these items in an in-person meeting to avoid endless email chains with questions, overlapping clarifications, and other notes. At the end of a design review or team meeting, post meeting minutes and action items to the wiki; this will also reinforce the practice of returning to the wiki for the latest information within your team. Most people think of wikis as a one and done setup. Quite the contrary, a wiki can become a living artifact that keeps everyone up-to-date on project progress. The most noteworthy way to leverage a wiki is to take ownership of it throughout, remembering to return to it to make regular edits to keep its contents relevant and easy to find. If the site layout plan changes one time too many in the beginning, add a link to the folder location where team members can find the latest revisions. If there is a new project contact during the VDC process, add their information to your contacts table. Spending time upfront to organize and curate your wiki will ensure those crucial details are available throughout the project lifecycle. Project landscapes have become more difficult to navigate due to tight project schedules, transparency requirements from the owner, new technologies that must be quickly leveraged, and disruptions like design-to-fabrication that are slowly gaining popularity in the industry. Wikis can help sustain open communication, manage expectations, and clearly outline responsibilities for the entire team. A simple shared wiki can help start your project on the right page. Looking to try out wikis on your project? 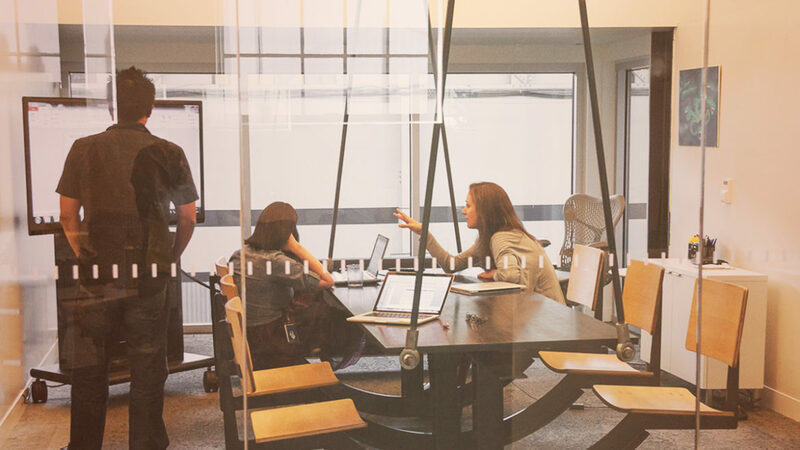 Try BIM 360 Team today.